4th Grade is an interesting year. They are ready and eager to learn how to type and we do spend a bit of time keyboarding. Many of them are very involved in some kind of social networking sites at home so Internet Safety is a topic that I feel must be covered. For all the time that 4th Graders can spend online, they still need a lot of guidance not only in safety but in Internet Literacy. I definitely need to cover this more next year in the lab. They love competing against one another in computer games and enjoyed World Math Day and love to visit sites like Arcademic Skill Builders and Tutpup. Most 4th graders still enjoy using KidPix and other graphics programs and it’s amazing how good some of them are in using these programs. The major online collaborative project that 4th Grade participated in was the Voices of the World project. This was the second year that 4th grade has done this project. I love the idea of classes all around the world using art and voices to express themselves on a theme each month. However, there is not much interaction between schools other than having the projects posted on a wiki. The project organizers want a single student voice to say each word or phrase but I need something that involves all of my students and because I had to create multiple versions of the project so that each one only had a single student voice, I fell behind in getting our assignments up each month. Also, comments aren’t allowed on the wiki and most classes don’t comment on one another’s projects at the source of the project. I am currently looking for some other project to involve my 4th graders in next year because I want one that provides more of a real connection between classes and something that the students can hopefully maintain themselves. 4th Grade also created a Tongue Twister VoiceThread. They enjoyed creating the VoiceThread and taking one another’s challenges. We had hoped that others would listen to and take the challenges presented but sadly that didn’t happen this year. Are you interested in taking the challenges? You still can! Even though we covered it in 3rd Grade and 2nd Grade, 4th Graders need to be reminded that it’s one space between words & no Enter Key unless it’s a new paragraph. I worry that I’ll bore them if I repeat things from prior years but I have found that they really do need the review. I am working on coming up with new fun ways to do the reviews but I definitely have to do them! If I can make it a game they’ll definitely be interested. Speaking of review, one way that I have found that definitely engages 4th grade it to make it some kind of game. Even some 4th Graders are on Facebook. I love social media and I get why the kids want to have accounts but I worry about having them on these types of sites this young. Many of our 4th graders who are one friend our Middle School students or even students who have graduated from our school and are now in High School. I don’t care how “good” kids are the things posted by friends on the wall of a Middle School or High School student are often not appropriate for a 4th grader. I really feel that I need to do some parent education on Social Networks next year. Just because an online collaborative project sounds good, it’s not necessarily a good fit for everyone. Having worked with the Voices of the World project for two years now I can honestly say I don’t think it’s a good fit for my 4th graders. It’s time to find something that is! What are some technology activities and projects that are successful with your 4th Grade students? Last year, I wrote three different reflective posts about the year (Time Zone Experiences, Monster Project & Scattered Thoughts). I’m still working on posting final projects and as I am working on this I want to capture my thoughts about the year for each grade level starting with my youngest students. They are all very good at finding all of the letter keys on the keyboard. Have you ever noticed that the I on the keyboard looks like a lower-case L? This can be very confusing to Kindergarten students. This year my Kindergarten students participated in two online collaborative projects: Winter Wonderland project and KinderKids Draw project. I loved seeing their understanding that other classes from different places were doing the same things as they were when they listened to comments on their introductory VoiceThread for the KinderKids Draw project and when we received Christmas cards from other classes participating in the Winter Wonderland project. I enjoyed both of the projects as did the students but I wish the KinderKids Draw project had been more directed or interactive somehow. I love the concept of this project but I think it needs something so that it doesn’t end up just an introduction and nothing else which is what it ended up being for me this year. I’d love to see interaction on the Teacher Planning page with some kind of discussion about an activity to be done and then a way to vote on an activity each month or each quarter. Repetition is a good thing. I often worried that they’d be bored going to Starfall again or or doing all 26 letters in the alphabet on their Adventures in Keyboarding activity, etc. but they weren’t. They loved doing the same things and discovered new things whenever they did. Include movement whenever possible during whole class instruction. One of the favorites this year was a lesson about the Winter Olympics. The introduction to this was an activity where they pretended to be each different type of athlete and they just loved this. So, my goal for next year with Kindergarten is more movement! 10 minutes is the limit for whole class instruction. There were times I planned what I thought was a really fun way to introduce the next project that Kindergarten would be doing. It was fun but after about 10 minutes a hand would go up and I’d hear “Can we go to the computers now?”. They want to be on the computers and I need to remember to limit anything not hands on to 10 minutes if I want them and me to be happy. Kindergarteners love microphones! As students get older they tend to get more reticent about recording their voices at times but boy did my Kindergarten students love to get their hands on a microphone. Do you teach Kindergarten students in a computer lab? Are you a Kindergarten teacher who is integrating technology into the classroom? What are some of the activities and projects that are successful with your students? Another class and another collaborative project – this time, it was my 3rd grade class and they were participating in the Monster Project. I felt this project was a lot of fun for the students and they learned quite a bit about being detailed with their writing. 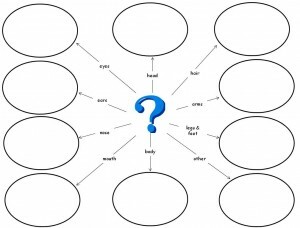 I really appreciated the lesson plan ideas on the Monster Project wiki and used many of these with my class. The video was a fun review of adjectives and the students enjoyed it. Then, we read the book Many Lucious Lollipops by Ruth Heller and created a favorite food adjective web in PowerPoint. Once these were completed, I took two of them and read just the words describing the food to see if the students could identify the food – one of them was easy to identify and the other was more difficult. We then took some time to figure out what words could have been used to make it easier to identify the second food. The first drawing class started out with the book Go Away Big Green Monster by Edward R. Emberley and instructions on how to draw their monster. We discussed how it would be easier to describe their monster and for their partner to re-draw their monster if they used simple shapes like circles, rectangles, triangles, etc. Even though the students were told to keep their monster simple, some of the students used non-standard shapes and some of the fancier paint brushes in KidPix. I had planned two class periods for the drawing portion of this project but we actually used more time than that due to absent students and accidental saving of a blank picture on top of a completed monster. The first step in describing the monsters was to create an adjective web for their monster by coming up with describing words for each monster body part. 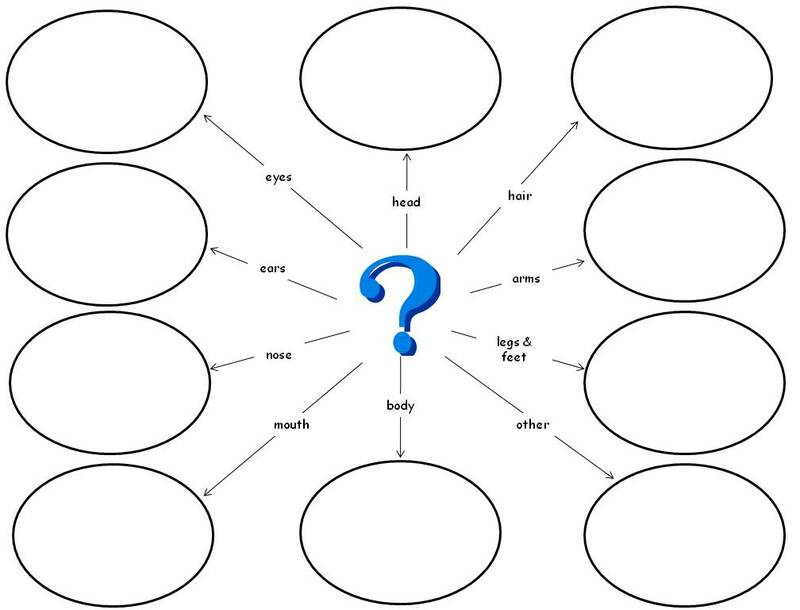 I created a template in PowerPoint and printed this out for student to use with their monster. Some of the students completed this quickly while others had a more difficult time with it. It took two class periods for all of the students to have this completed. One thing I noticed in this process is that in some cases it would have been better for the student to describe their monster in a way that didn’t include using adjectives. For example, one of my students drew a monster that looked like a wave coming out of the water. He described it with adjectives like blue and curved, etc. but it would have been much easier to redraw if he had just said it looks like a wave coming out of the water. Next year, I will emphasize that sometimes you can describe things not only with adjectives but in other ways too. I then added a Monster Prompts template to each student’s computer and they used this in Word to write their monster descriptions. This step took more time than I thought it would due to student absences, lack of Word and keyboarding skills and difficulty in the actual writing process. After doing this in the lab, I feel that the actual writing process should be done with the classroom teacher instead of at a computer. It is difficult for the younger students to compose in Word. Next year, if we do this project again, I will have the students write their descriptions with their classroom teacher and just type them during their time in the computer lab. I have already mentioned this to the 3rd Grade teacher for next year. After the students were done with their monster creation and descriptions, I combined all of the descriptions into one Word document and exported all of the pictures out of KidPix as JPG and resized them according to the instructions on the Monster Project wiki and then added our descriptions and our monster pictures to the wiki and updated the main page on the wiki to reflect where we were in the process. I think this was a really great idea on Anna and Ann’s part so that you could easily tell where your partner school was. The timing between our two schools was pretty good in getting the project completed and online. Before the students redrew their partner’s monster, I printed out two monsters from last year’s project along with their descriptions. I purposely picked one monster that was described really well and one that did not have a really great description. We then went into KidPix as a class and drew the monsters from their descriptions only and crossed out each sentence of the description as we went. The students were amazed at the monster that was described well and how it matched the original. They were frustrated with the second description because it was missing information on colors and some of the body parts. This is when I saw the light bulb truly go off for them. Some of them realized at that point things they might have left out of their own descriptions or ways they could have drawn their monster to make it easier for someone else to recreate. Next year, I will do this same thing before we ever draw the monsters and maybe even repeat it before we write the descriptions. Each student was given the description of a monster drawn by a 3rd grade student in Mintot, ND. They were really excited to try to draw their partner’s monster. Some of them discovered that the descriptions were detailed and made it easy to draw what they thought the monster should look like. Others discovered that things like the color of their monster and other important details weren’t there. Good descriptions or not so good descriptions, everyone finished their redraw within a few class periods and then I uploaded the redrawn monsters to the wiki. My students were all really excited to see what the students in Minot, ND had drawn from their descriptions and to see what their partner’s original monsters really looked like. We took two classes to view these and I heard a lot of “But they didn’t draw what I said” and “Wow that looks like my monster” and “Hey that’s pretty close”. After we had looked at them all, we talked about why there were differences especially in colors. It’s hard for 3rd graders to understand that even though your blue and their blue are different that doesn’t mean that they drew it wrong. It could be that they used a different drawing program and the blues in there are just different than the blues in KidPix. We spent some time reviewing some of the monsters and descriptions to see where things had gone right and where they had gone wrong. 1. What did you enjoy most about the Monster Project? 2. Was there anything you didn’t like about the Monster Project? 7. What words made it easy to draw your partner’s monster? 8. What words were missing or wrong that made it hard to draw the monster? 9. What do you think they should have added? This step in the process took 3-4 classes to complete because the students had to think about their answers and write them in complete sentences. After they had their written answers completed, they had to actually record their answers in PowerPoint. I then combined these into one big presentation but I wanted to just take the recording from the first slide for each student and put them all on one slide and let people click on the voice they wanted to hear and then continue through the other slides. I created this in PowerPoint and it worked great. I typically upload and share PowerPoint presentations in SlideBoom because it keeps voice and transitions and animations, etc. This time it didn’t work, however, since the ability to click on the speakers went away when I uploaded the presentation which meant you couldn’t hear what the students had to say – so it was on to Plan B for this one. 1. Save the presentation as a web page. This exports all of the sounds files for me. It exports other things too but I was interested in getting the sound files. 2. Take all the speakers off the slides and then save the presentation as jpg images. This saves all my slides as individual images. 3. Upload all the images to create a new VoiceThread. It might be a good idea to rename the files before uploading since it names them slide1, slide2, etc. which means slide2 will come after slide 10 and not right after slide 1. I didn’t and just reordered them in VoiceThread. 4. Using each of the student identities that I already have under my account, upload the sound files as comments on the slides in VoiceThread. I did change the pictures for each of the student identities to match the Monster Project since this class had not done any other VoiceThread project this year. Voila! A VoiceThread from a PowerPoint including the recorded information on the PowerPoint. Ann Oro had also created a VoiceThread for reflections from the teachers on the project and I spent some time adding my reflections to that too. I am interested in hearing what everyone else has to say about the project. One slight disappointment I had with the project was the fact that we didn’t get to Skype with our partner class. We were attempting to set this up but they were out of school about a month before we were and I hadn’t realized that fact and we didn’t get this set up before they were out for the summer. I think this is a wonderful project to teach the students about descriptive writing and to get teachers involved in an online collaborative project.